There is no consideration or reporting of water quality parameters in the zoning, siting, or management of aquaculture farms. There is no industry-wide Code of Good Practice (CoGP). Instead, the industry adheres to legislation concerning zonal approaches to planning and disease prevention and control. Meanwhile, individual producers focus on adherence to international certification standards, while members of the GSI are bound by its commitment to adopt ASC standards by 2020. Not all identified feed companies’ disclosure their source fisheries. There are significant sustainability concerns in many of the identifiable source fisheries. There is a moratorium on new licenses in Los Lagos. AMAs - also known as barrios, neighborhoods, or “salmonid groups of licenses”- were first introduced following the ISA crisis and aim to coordinate disease control, particularly sea lice and ISA (Alvial 2017) . AMAs set minimum distances between farms and require farmers to coordinate (synchronize) management and biosecurity measures (Alvial 2015) (Alvial 2017) (Arriagada et al. 2017) . There are currently 25 AMAs in Los Lagos incorporating 505 concessions (licenses) (Alvial 2015) (Alvial 2017) . Macro Zones, which may include two or more AMAs, focus on emergency fish health responses and only activate in these cases. There are currently 5 Macro Zones in Los Lagos (Alvial 2015) . There is currently a moratorium on new salmon farming licenses in Los Lagos which has been in place since 2010 (Alvial 2017) (Cardenas 2015) . Authorized commercial treatments for sea lice are deltamethrin 1%, diflubenzuron 80%, emamectin benzoate 0.2%, and cypermethrin 5% (Ibieta et al. 2011). There is a maximum of three immersion treatments during a production cycle (Sernapesca 2016) . The MRL of these substances in export markets is provided by Sernapesca’s best practices on veterinary drug use (Sernapesca 2011) . A lack of government inspection and enforcement efforts was acknowledged to have been a major factor contributing to the ISA crisis of 2007-2009 (Wilson et al. 2009) . Following this, increased sanctions for non-compliance were introduced along with an increase in the number of inspection staff (Alvial et al. 2012) . Licenses can be terminated due to a single severe non-compliance with license requirements (e.g. such as the culturing of a different species, genetically modified organism (GMO) or exotic species without authorization) or if there are three sanctions over a period of two to three years (Alvial 2017) . Sernapesca provides details of judicial and administrative sanctions levied for aquaculture infringements from 2008-2013 (Sernapesca 2013) (Sernapesca 2013) . During this period, there were 20 judicial sanctions in Los Lagos (of 36 nationally) and one administrative sanction. There is no compliance information available after 2013. Health Management: In Los Lagos in 2014, 18.8% and 3% of sites classified were classified as Alert and CAD, respectively, for SRS/Piscirickettsiosis. In 2015, these figures were 21.1% and 3% (Sernapesca 2016) . Infection with HPR-deleted ISAv (an OIE notifiable disease) was recorded once in Los Lagos in 2014 (World Organisation for Animal Health (OIE) 2017) , as well as 21 cases of infection with HPR0 ISAv in 2015 (Sernapesca 2016) . From 2014-2015, sea lice levels in Los Lagos ranged from around 0.5 to 2.1 adult lice per fish (Sernapesca 2016) . In 2015, the average level of sea lice per fish for SalmonChile member companies was 2.78, which was almost 50% less than 2013 levels (SalmonChile 2017) . From 2014-2015, the number of sites classified as CAD for sea lice nationwide ranged from <5 to around 30 (around 1-12%) (Sernapesca 2016) . Health Management: Outbreaks of ISA and sea lice have decreased significantly since peaks in 2007 and 2008, and farm performance indicators are now surpassing pre-ISA crisis levels. From 2014 to 2016, several incidents of infection with either the HPR-deleted or HPR0 genotypes of ISAV have been recorded nationally. However, HPR0 ISAV has never been associated with ISA in Atlantic salmon (World Organisation for Animal Health (OIE) 2017) . From 2007-2010, sea lice levels nationwide declined largely due to a fall in production caused by the ISA crisis (Hindar 2014) . This was followed by an increase in sea lice levels from 2011-2013 (Sernapesca 2013) (Sernapesca 2014) . From 2014-2015, average weekly numbers of adult sea lice per fish have remained fairly constant in Los Lagos and below threshold levels (Sernapesca 2016) . Health Management: Authorities are considering new regulations that would modernize how licensed production limits are set. Under the proposed regulations, producers would be able to opt for either a maximum allowable net-pen density below the current limit of 17 kg/m3 or vary the net pen density limit according to the health status of the fish (without exceeding the current maximum) (Villegas 2016). The new system aims to increase profitability and reduce the costs associated with disease treatment. The new regulations were anticipated in 2017, but there is no indication that they have been implemented. Research into SRS vaccines also continues (Villegas 2015) . Under the Under Sernapecsa’s new program for the surveillance and control of sea lice, the use of non-pharmacological control strategies is encouraged but recommended non-pharmacological approaches are not detailed (Sernapesca 2015) . Licenses can be terminated if there are repeated environmental infringements or anti-union actions (Alvial 2017) (Alvial et al. 2012) . Online details of judicial and administrative sanctions levied for aquaculture infringements are available from Sernapesca for 2008-2013 (Sernapesca 2013) ; however, there is no data more recent than 2013. In 2010, authorities imposed a five-year moratorium on new salmon farming licenses in Los Lagos, which was extended in 2015 for another five years (Alvial 2017) (Cardenas 2015) . There are currently 25 AMAs in Los Lagos incorporating 505 concessions (licenses) (Alvial 2015) (Alvial 2017) . There is evidence of the establishment of Macro Zones for sea lice and SRS in 2015 (Sernapesca 2016) . Sanitary reports and research surveys for ISA, coordination treatment windows, details of CAD centers for sea lice, and a 2013 report on the monitoring and control of SRS are all available via Sernapesca’s website (Sernapesca 2013) (Sernapesca 2017) (Sernapesca 2018) (Sernapesca 2018) . Online details of judicial and administrative sanctions levied for aquaculture infringements are available from Sernapesca for 2008-2013 (Sernapesca 2013) . The majority of judicial sanctions during that time were due to fish health-related issues. Sernapesca’s most recent health report of salmon culture in marine centers indicate that 14 Macro Zones were established in Los Lagos in 2015 for SRS (5), ISA (5), and sea lice (4), which indicates a high prevalence of these diseases. General mortality rates range from around 1-2%. Although sea lice levels for Los Lagos are below threshold levels, there are a number of sites that were classified as alert or CAD for SRS in 2014 and 2015 indicating a high frequency of occurrence for SRS. (Sernapesca 2016) . Production statistics and number of farms were sourced from Sernapesca (Sernapesca 2011) (Sernapesca 2012) (Sernapesca 2013) (Sernapesca 2014) (Sernapesca 2014) (Sernapesca 2015). There was one outbreak of ISA in Los Lagos in 2014. In 2015, there were 21 confirmed cases of infection with HPR0 ISAV - a stain of the infectious salmon anemia virus that has never been associated with ISA in Atlantic salmon (World Organisation for Animal Health (OIE) 2017) . Diseases reported to OIE included 15 cases of HPR0 ISA and two cases of HPR-deleted ISA. 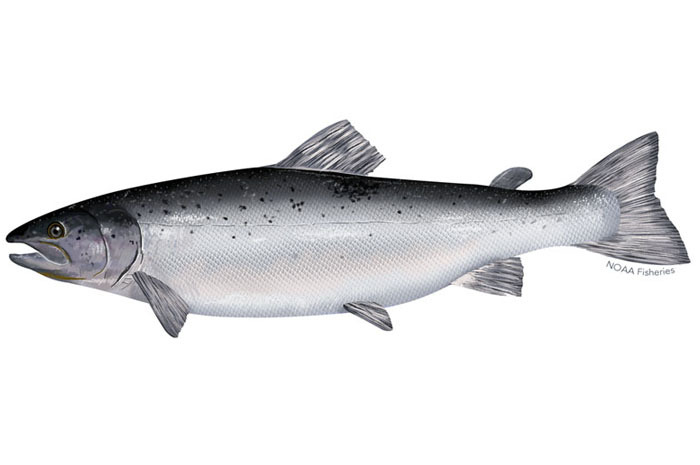 Infection with HPR-deleted ISAC may cause ISA in Atlantic salmon. Sea lice infestations from 2014-2015 ranged from 0.5 - 2.1 adult lice per fish in Los Lagos (Sernapesca 2016) . These values are below the management threshold of 3 gravid females for the first week following an official establishment treatment period and, as such, none were classified as an 'outbreak'. More than 90% of Chilean salmon farming occurs in Regions X (Los Lagos) and XI (Aysén), with the remainder occurring in Region XII (Magallanes) (Sernapesca 2016) . The Los Lagos Region is located south of Aysen region and is part of Chile’s northern Patagonian Fjords, which are composed of a system of islands, channels, and fjords. The Fjord system is considered as one of the most complex estuarine systems in the world and is home to World Biosphere Reserves (Molinet et al. 2014) . Authorities are expected to release new regulations to lower production levels imminently (Villegas 2016) . Under the proposed regulations, producers will be able to opt for a maximum net-pen density less than the current limit of 17 kg/m3 or to allow the limit to vary according to the health condition of the fish (but not to exceed the current maximum). The new regulations were anticipated in 2017, but there is no indication that they have been implemented. In 2015, a 5-year moratorium enacted in 2009 on new licenses in Regions X (Los Lagos) and XI (Aysen) was extended for another 5 years (Cardenas 2015) .